this year the CMDC, the research centre I am located at, is organising a reading group for faculty and dphils. 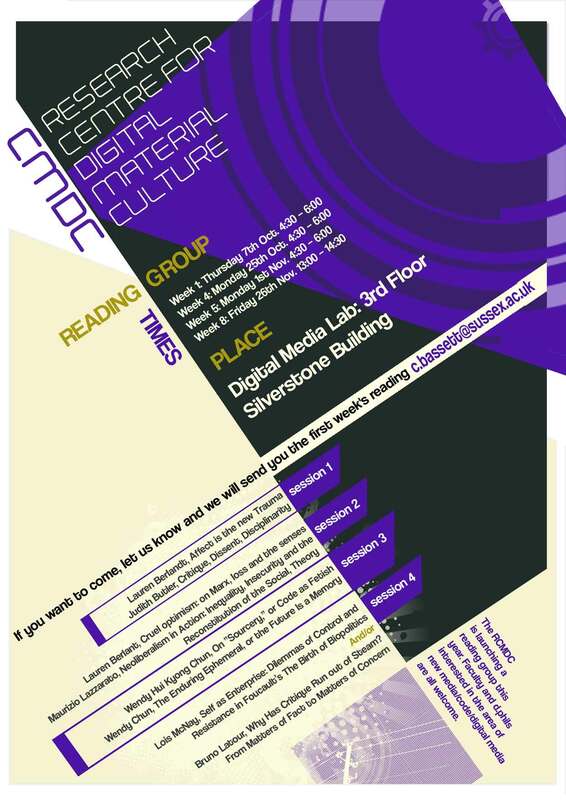 Place Digital Media Lab: 3rd Floor Silverstone Building. Lauren Berlandt, Affect is the new Trauma, Minnesota Review. Winter/Spring, 2009. Judith Butler, Critique, Dissent, Disciplinarity, Critical Inquiry, Summer, 2009. Maurizio Lazzarato, Neoliberalism in Action: Inequality, Insecurity and the Reconstitution of the Social, Theory, Culture & Society 2009 26: 109-133. On “Sourcery,” or Code as Fetish, Wendy Hui Kyong Chun, Brown University, Configurations, 2008, 16:299–324, 2010 by The Johns Hopkins University Press and the Society for Literature and Science. Wendy Chun, “The Enduring Ephemeral, or the Future Is a Memory,” Critical Inquiry 35:1 (2008): 148–171. Email Caroline Bassett (c.bassett@sussex.ac.uk) to send you the reading. This entry was posted in Conferences and papers, internet research and tagged cmdc, reading group on October 5, 2010 by Aristea Fotopoulou.